Longboarding is more than its tricks, disciplines, and competitions. It’s a mode of transportation, a weekend pastime, a social activity, and a way of life. Its versatility has inspired people to create new products that improve old designs, reinvent the board, and enhance aesthetics. This brings us to an innovative design, a French inventor, and the birth of a company, Non Universal Nuts. 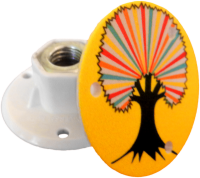 The design in question is the RADnuts, a decorative accessory for longboards and cruisers that acts as a wheel cap and replaces the axle nuts of the trucks. Sleek, lightweight, and fashionable, the RADnuts comes in a set of 4 and is made from a sturdy polycarbonate plastic material. Each weighs in at just above 4 grams so it won’t weigh your skating down. The RADnuts are available in eight different original graphics. The collection of unique graphics are sourced and designed by artists from around the world. The current first generation line features the works of young, European artists. Each generation thereafter will feature new designs by new artists from different continents. In order to ensure the visibility of images from near and far, Non Universal Nuts offers the largest amount of printable surface available with 1.4 inches of customizable space. Designed with strength and durability in mind, the RADnuts can easily handle the movement and shock of the hardest ride. It aids in bearing protection, theft deterrence, and can weather the elements. Don’t be afraid of skating hard and damaging the design, Non Universal Nuts utilizes digital printing which produces a clear, bright, and crisp image and makes it extremely resistant to scratching. It requires over 200lbs of force to pull the body from the nut. You might say the RADnuts has the brawn to match its beauty. The RADnuts has been tested on over 100 different varieties of wheels. Compatible brands include Penny, Orangatang, Krypto, Cadillac, Abec 11, Sector 9, Cult, Hawgs, Road Rider, Seismic, Cloud Ride, Free Wheels Co, Rad, RAM, Globe, Zflex, Bureo, Choke, Shark Wheel, Rune, and more. Every RADnut is proudly made in the USA. Concepts for the RADnuts were first conceived by engineer Philippe Maigret while he was still a university student in Lyon, France. It was Philippe’s love and passion for action sports that led him to start dreaming about something that would flesh out the look of longboards. Philippe came to the United States in May of 2014. It was there he began the labor intensive process of doing research and development for the RADnuts. A prototype was developed and in August of that same year, a market research study was conducted on the fledgling product. The study turned out to be successful and people were enthused with Phillipe’s creation. The positive feedback was enough that within the next six months, he would manage to launch his own company and the product he’d spent months perfecting. The RADnuts are currently retailing for $18.00 and is available online at shop.nonuniversalnuts.com and will soon be available in your local skate shop. 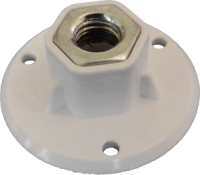 Customizable RADnuts are also available for retailers, brands, and associations. Inquiries can be sent directly through Non Universal Nuts’ website contact section. To see more, check them out on their website nonuniversalnuts.com and through social media @nun_skateboards on Facebook, Instagram, and Twitter.